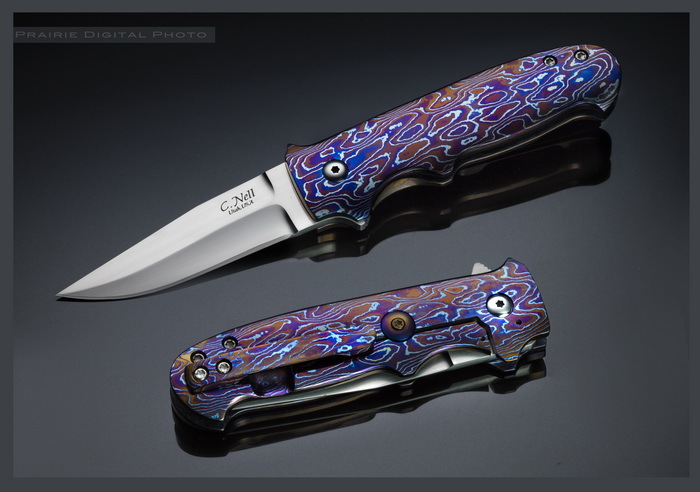 Chad Nell has crafted one of his spectacular NYF flipper folders with a 3-inch blade of hand-rubbed CTS-XHP high carbon stainless steel. The NYF is designed to mimic the iconic Bob Loveless fixed blade New York Special. The frame and integral framelock is of Chad Nichols heat-colored Scrambled Mokuti and a matching heat-colored 3D-machined tip up pocket clip is fitted. Mokuti is a Titanium laminate consisting of 6AL-4V alloy Titanium and commercially pure Titanium. Chad Nell was born in Manti, Utah in 1971. While growing up, he noticed that his father, who was a Master Mechanic, enjoyed the challenge of making beautifully crafted arrowheads from flint gathered in the surrounding hills. Throughout his childhood, Chad developed an intense appreciation for seeing things built from scratch while using one’s hands and mind to design and create wonderful treasures. Chad has always dreamed about making things that embodied precision, functionality and beauty. Luckily, Chad inherited his father’s talent of working with his hands! While pursuing this great desire of working and creating with his hands, Chad was fortunate to gain his custom hand made knives knowledge and skill under legendary knife makers Steve Johnson and John Young. He watched and learned, with great admiration, as those two masters created works of art. Chad Nell has always had a strong attachment to his roots of Utah. Over the years, he has held various occupations but just wasn’t satisfied. His heart and spirit kept pulling him back to creating and making things with his hands. Being an avid outdoors-man, he always enjoyed hunting. While using a “factory” knife when hunting one day, he decided he should contact his Uncle Steve for some help on building his own custom knife, and that’s where he got his start! Since then, Chad has consistently sold out at every knife show he attends. He feels it is just something within him that helps him achieve that exact precision and beauty while creating a Chad Nell Knife. Chad lives in St George, Utah with his family. He enjoys spending quality time with his family while making custom knives for customers all over the world. He also attends some of the major Knife Shows when time permits.